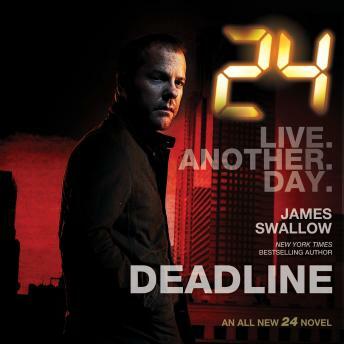 James Swallow's 24: Deadline. This tie-in novel to Fox's groundbreaking TV show 24 answers the question of what happened to CTU agent Jack Bauer after the thrilling final moments of the last season. The time is 5:00 PM. One hour ago, federal agent Jack Bauer was declared a fugitive. If he wants to survive, he must get out of the country, and he doesn't have much time. With his former colleagues in the Counter Terrorist Unit now dead, under arrest, or shut down, Jack has no resources to call upon, no back-up, and nowhere to go-only his determination can drive him on. One thing remains clear to him: the promise he made to his daughter Kim. Jack vows that he will see Kim one last time to tell her he loves her...before he drops off the radar forever. Stay out of my way, and I'll be gone within 24 hours. You'll never see me again. Come after me...and you'll regret it.